The San Diego Chargers are coming off yet another disappointing loss against a team that they should have easily beaten in the AFC West division rival Oakland Raiders. Even though division rivalries like this are always hard fought battles, Philip Rivers and company had gotten the best of the silver and black in 13 straight games before Week 5’s loss and it seems as though the hits just keep on coming for Bolts. Heading into this NFL regular season, the Chargers were considered to be the clear favorites to win the AFC West division once again and possibly make it all the way to the Super Bowl, but the way this season has started for Norv Turner’s squad, they will be lucky if they can even lock up a playoff spot at season’s end. There is no question about the talent on this San Diego Chargers team led by two-time Pro Bowl quarterback Philip Rivers, but they are infamous for getting off to slow starts every year and this season is no different as they will be heading into their Week 6 matchup with the St. Louis Rams sporting a 2-3 record and sitting behind both the Kansas City Chiefs (3-1) and the Oakland Raiders (2-3) in the AFC West division standings. Just like in years past, the consensus around the league is that the San Diego Chargers will start turn it around as they always do, but they might have their hands full in Week 6 against an up and coming St. Louis Rams team led by promising rookie quarterback in Sam Bradford. 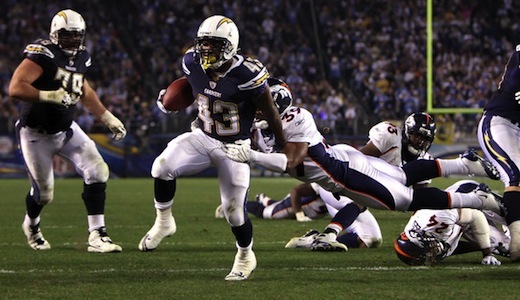 Obviously, even though they have played pretty poorly over the last few weeks, the Chargers are favored to win this game and by a big margin (-9), but if they can’t contain Rams running back Steven Jackson in the ground game and quarterback Sam Bradford in the passing game, Norv Turner and company could be in trouble and in danger of falling to 2-4 on the year. Even if the Chargers do get out of this game alive and manage to even up their record at 3-3, things will not get any easier down the road as their schedule is pretty tough from here on out as they are set to play the New England Patriots (3-1) next week and teams like the Tennessee Titans (3-2), Indianapolis Colts (3-2) and the Kansas City Chiefs (3-1) in the following weeks. Needless to say, this is pretty much a must win situation for the San Diego Chargers as they could very easily see their season spiral out of control if they don’t come out on top against the St. Louis Rams, but even though they have struggled to start the season once again, I believe they should get back to form this Sunday and get back into the mix in the AFC West division.